Slovenians massively supporting Cannabis legalization! 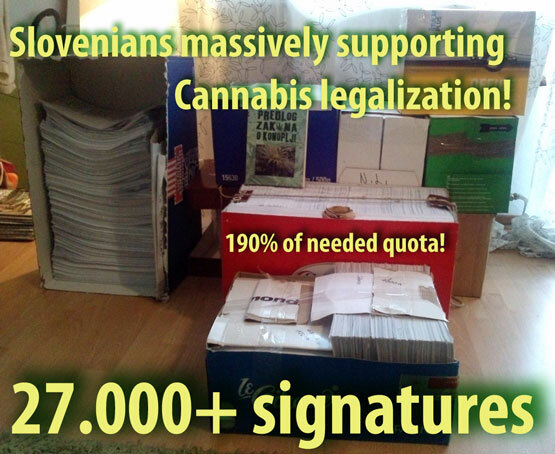 Thanks to the massive response of the slovenian voters, the number of supportive signatures is almost twice as much as needed for a draft law to be debated in the parliament! draft law on cannabis: 10879 signatures! draft law on self-healing: 8835 signatures! draft law on basic existance: 8032 signatures! We are very satisfied that the people proved that they are awakened and well aware of the importance of access to medicinal plants and of knowledge about their use. We are blessed to find that the people are aware that personal freedom about one's own body is the best key to public health wellbeing. We are glad, that the people overcame the prejudices, that they were fed by the international coorporations, which denied our rights to medicinal plants, like cannabis, that were used by our grandmothers and their forefathers. We are very happy about this step towards victory of the people and of common sense. Now we have to carry the procedure to the succesful conclusion. We hope, that our parliamentarians won't be deaf and dumb to the will of the people and we expect that they will inform themselves thouroughly with the matter before the parliamentarian debate and support this beautiful opportunity, to pull our country out of our economic, financial and ecological troubles, an opportunity for our country to blossom once more as a country of healthy and wise people, an opportunity to enter a new, freer, happier and a healthier era!